The Group’s motorcycle sector has also made great strides. The Aprilia brand recorded an increase in sales of the “naked” model from the Tuono family, the new Aprilia Shiver 900 and Dorsoduro 900 (launched in June 2017), and the new 125cc, RS and Tuono, launched in April. Moto Guzzi’s turnover was driven by the positive sales trend of the V7, which in 2017 celebrated its 50th anniversary with a special model. 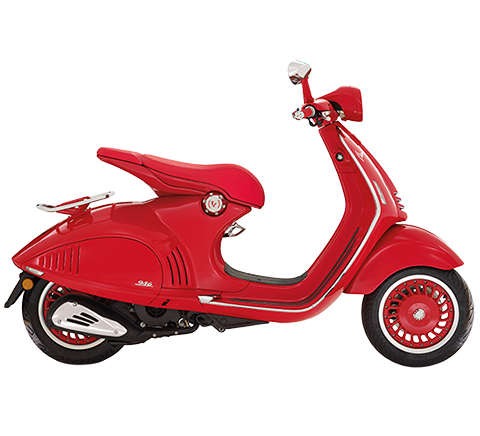 Electric mobility has never been so fascinating, stylish and elegant: Vespa Elettrica is not just an electric scooter, it is Vespa Elettrica, a contemporary work of art with a technological heart. Vespa Elettrica means easy, but natural, driving. It means total connectivity and silence, customisation and accessibility, values that have always been a part of Vespa and which today find their fullest implementation. This is another step by Moto Guzzi towards the near future, which will bring the Mandello Eagle to celebrate its 100-year anniversary in 2021 with a new range of motorcycles built on the technical base of the V85. It is a motorcycle dedicated to trips, which have always been the heritage of Moto Guzzi in their purest and most original manner, which bring to mind the epic and adventurous rally raids of the 1980s, a world from which it has inherited style, charm and emotion, but which has been designed to face both everyday and long-range roads, according to the most up-to-date requirements and the forthcoming ventures. The V85 pays tribute to the great adventurous trips and is dedicated to those who, despite never ceasing to dream of adventurous journeys, are seeking out a motorcycle capable of returning that spirit to their everyday journeys. A new Moto Guzzi engine is being launched in the V85. 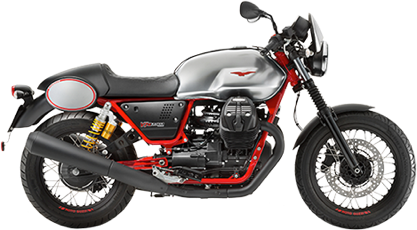 The construction design is proprietary and excludes the entire current Moto Guzzi production: in fact, it is a two-cylinder 90° transverse air-cooled 850cc which, thanks to its complete redesign, has 80 HP of maximum power. This feature, coupled with the powerful torque at low speeds typical of all Moto Guzzi two-cylinders and the lightness of the V85, make it fun to use in for on-road and off-road riding. The V7 III family growing with the new special versions of Carbon, Rough and Milan, Moto Guzzi’s homage to the art of customisation. They are distinguished by the different layout obtained by using originality and competence to introduce a series of high quality special parts, capable of returning to each motorcycle a very different connotation and a unique character. The V7 III Carbon (in limited edition and numbered) celebrates customisation, when interpreted with originality and good taste, combining V7’s authentic style with the precious and modern quality of many carbon fiber components, as well as numerous other contrasting details in red colour as the engine heads, the seams of the new seat in Alcantara material and the Brembo front brake calliper. The V7 III Rough is distinguished by the knobbly tyres cast on radial spokes and the many details that give V7 III Rough a country citizen style. The equipment is completed by the dedicated seat with stitching, a passenger grab strap and the pair of aluminium side fairings. The V7 III Milano is distinguished by its highly refined style and high-end gear, including dual circular instrumentation, chrome exhausts and passenger handlebars. It is distinguished by the shiny colours of the tank and for the spoked wheels that contribute to giving it a modern look. The standard equipment is completed by prestigious details such as the aluminium fenders and side fairings. V9 is Moto Guzzi’s easy cruiser. V9 Roamer is the elegant and universal custom model; V9 Bobber represents the bold and essential spirit of Moto Guzzi. They both stand out because of the exceptional quality of their components and the painstaking attention to detail and they are powered by the Moto Guzzi 850 cc two-cylinder engine with unprecedented torque, smoothness and responsiveness that contribute to enhancing the ride for these two Italian cruisers. The 2018 V9 versions are the result of the constant perfecting that Moto Guzzi dedicates to its bikes. Roamer and Bobber are now distinguished by a big difference, with two clearly distinct personalities: one more touring and the other sportier. V9 Roamer turns heads even more on long routes by introducing a new pair or rear shock absorbers and a new protective top fairing. V9 Bobber gains new opaque graphics and is available in three colour variants: Impeto blue, Nero Notte black and Tempesta grey. 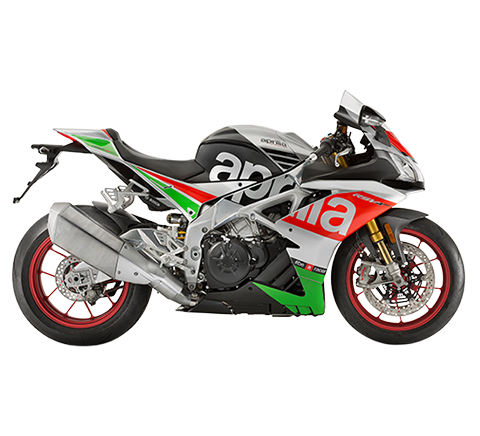 Aprilia Racing is the most advanced Piaggio Group platform for the development of technology applied first to racing bikes and then to factory models. The Racing Division that has brought the Noale-based Manufacturer 54 world titles, launched the “Factory Works” programme last year to make the same technology developed for the Aprilia RSV4 - seven-time World Superbike champion - available to anyone who wants to compete in top-level championships for standard derivatives or for those who simply want to have an RSV4 with optimised performance for track use. The programme has been expanded with the introduction of an Aprilia RSV4 kit that maximises engine performance, reduces overall weight and improves aerodynamics. Thanks to new pistons, different heads, full racing exhaust and regenerated control unit, the engine reaches 215 HP. The additions that lighten it include a lithium battery, a new fuel tank, which, together with the complete exhaust system, some carbon pieces and the aluminium upper casting plate made in a single piece, carry a total weight of around 10 kg. The new Factory Works kit can be further enriched by a flush mount set featuring aerodynamic appendages, developed by Aprilia on the RS-GP prototype used in the MotoGP World Championship. 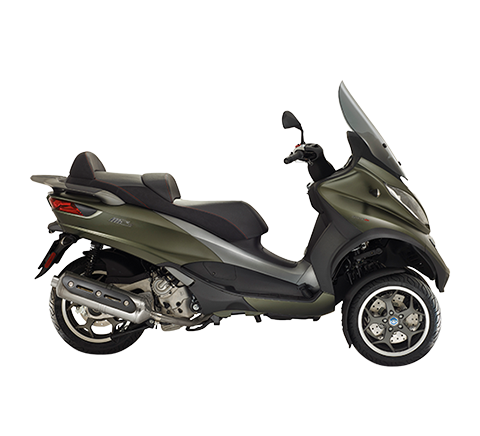 Heir to Aprilia’s successful history in competitions, the new entries to the off-road family combine the technological contents of the Aprilia tradition with a captivating look. Equipped with powerful and clean engines, they are available in five models and two cylinders. The new Aprilia RX 125 and SX 125 share superstructures, frame, engine and suspension, but each has a distinctive character that can be adapted to different passions. 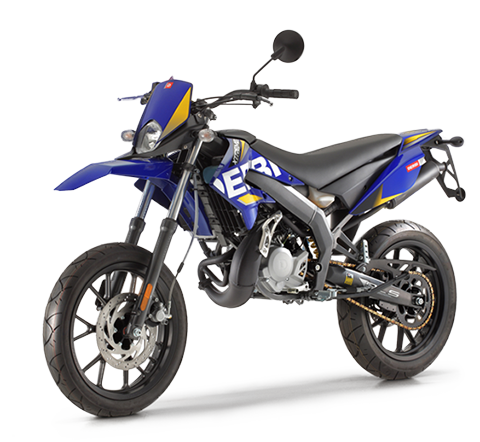 The wheels fitted with 17” sporty tyres make the SX one of the most effective 125cc bikes on mixed runs; lightweight and snappy, it is able to offer the emotions of a higher-powered engine capacity. Aprilia RX 125 is the ideal choice for having fun on off-road routes. They are both equipped with a refined single-cylinder 125 cc engine, an Aprilia engine that has been able to further refine the four-stroke engine, allowing it to enter the strict Euro 4 standard without compromising performance or driving pleasure. With their high efficiency, increased safety, RX and SX are equipped with advanced suspension and a new ABS braking system with anti-roll-over, which guarantees precision and total braking control and adjusts the rear wheel lift in the most decisive braking. 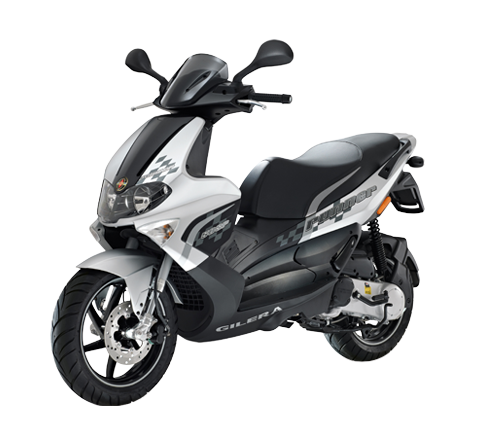 Available in three models, the SX, SX Factory and RX Factory, the 50cc models from the Aprilia family are equipped with a two-stroke, single-cylinder, liquid-cooled, Euro 4 engine with lamellar intake. This latest-generation engine boasts an electronic control carburettor and 3 catalytic converters to ensure controlled emissions and performance at all times. Common to all three versions are also the high-strength steel perimeter frame, made in an original silver colour, polished stainless steel exhaust, with a clear racing inspiration and the new digital instrumentation. Dominant in the 50cc category, the Senda X-Treme and Senda Racing models boast the best of Derbi’s values and meet the needs of young drivers while being completely renewed in design and graphics. Senda X-Treme is available in Enduro or Motard versions: one important difference between the R and SM versions is the wheels, which on the Enduro are 21” on the front and 18” on the rear with off-road tyres and spoked wheels, while on the SM Supermotard they are lightweight 17” alloy on both wheels, with road tyres. Also new are the light assemblies (the LED at the rear), the handlebar, the digital instrumentation and the seat. 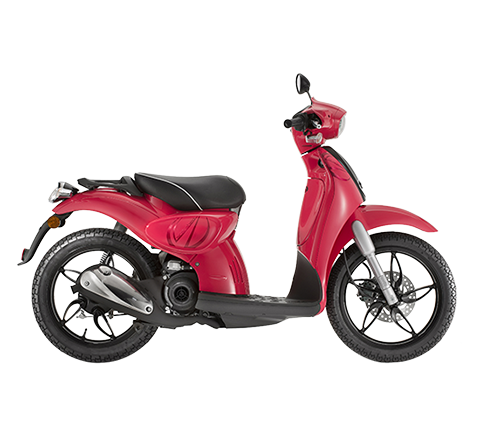 Both models are equipped with a brilliant 50 cc 2T liquid-cooled single-cylinder engine approved under current Euro 4 emission regulations; in the new dark grey colour, it is equipped with electronic control carburettor and 3 catalysts. Derbi Senda Racing, available in the SM version, is distinguished by its refined and specialised technical equipment, including the variable sectional handlebar in aluminium and the new 41mm inverted spindle fork. Gilera SMT and Gilera RCR, respectively the Supermotard model and Enduro model from Piaggio, feature a significantly revised look based on the improved technical content: new fairings, seat, graphics of clear sporting inspiration, the engine - compliant with Euro 4 anti-pollution regulations - steering indicators, fuel tank cap cover with lock. Also new are the light assemblies (the LED at the rear), the handlebar and the magnificent digital instrumentation. The frame, common to the two models, is made of high-strength steel with closed double cradle. Gilera SMT and Gilera RCR are equipped with a brilliant 50cc 2T liquid-cooled single-cylinder engine which guarantees top performance in the category. The SMT model shares with the RCR model the brake disks, 260 mm on the front and 220 mm on the rear, while the wheels in the rear are 21” on the front and 18” on the rear with off-road tyres and spoked rims, in the Supermotard they are in light alloy of 17” on both wheels, with road tyres.